Diecutting Punches – AmeriKen Online! AmeriKen has over 3 million punches in stock and ready to ship! With tolerances as close as +/- .005, AmeriKen punches knock out the competition! They don’t lose their sharpness! For gaskets, labels and like products which require exact cutting depths, our precision ground punches beat the competition hands down. AmeriKen can produce punches with heights that are accurate to a thousandth of an inch. AmeriKen punches save you costly, time-consuming adjustments. They prevent breakdowns, last longer, and give greater value. As a result, so do your dies. Cut Edge – The cut edge is the working end of the punch and usually varies from 20-30 degrees per side. The lesser the cut edge bevel, the less pressure it takes to cut, therefore preventing a distorted cut. All cut edges are machined, unlike rule, which may be ground or shaved. Base – The base is the body of the punch, which supports the cut edge. Bases come in many shapes. the base should always have a plus tolerance from “on size” to +.003″. A base should never be under sized. This will make it a loose fit. Height – Height is the overall length from the top of the cut edge to the bottom of the punch. The height of the punch is usually precision ground to assure the proper tolerance. 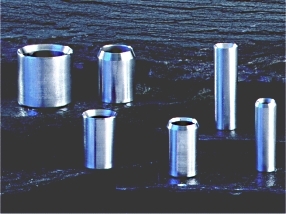 All AmeriKen punches are case hardened, using an exclusive heat treating process.